William Shakespeare (1564-1616) - As Einstein is to science, so Shakespeare is to writing. Easily regarded as the greatest playwright of the English language, he is also considered one of the greatest writers in history. 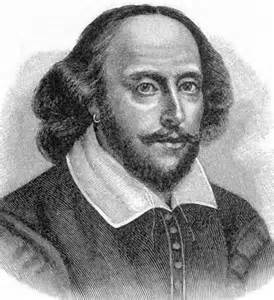 Having written some 38 plays, many of which are famous classics, and 154 sonnets, his works have been translated into every major modern language in the world. Despite his fame, obtained within his own lifetime, Shakespeare remains somewhat of a mystery. This is due primarily to fact that the only contemporary sources that exist are his own writings and a number of legal and public documents. Some believe many of his plays weren't even written by him. His birthplace, Stratford-upon-Avon is famous because him. At 18, he married Anne Hathaway, a woman eight years his senior. Between 1585 and 1592 absolutely nothing is known about Shakespeare's life. These are known as his "Lost Years". Because of this, we don't really know when he began writing. But in 1592, the Shakespeare we're familiar with today emerged in the London Theatre. A rival playwright named Robert Greene, who apparently didn't think much of Shakespeare's growing popularity wrote the following critique in his periodical, Groats-Worth of Witte: "...this upstart Crow, beautified with our feathers, that with his 'Tiger's heart wrapped in a player's hide', supposes he is well able to bombast out a blank verse as the best of you: and being an absolute Johannes fac totum, is in his own conceit the only Shake-scene in a country." The phrase "Tiger's heart wrapped in a player's hide" is a line taken directly from Shakespeare's Henry VI, part 3. Johannes fac totum is a Lantinised term popular at the time meaning a "Jack of all trades" (used derisively), and "Shake-scene" is a reference to the bard himself. Over the next two decades, he wrote roughly two plays each year. By 1594 he, along with a group of thespians, had become popular enough to form their own acting company known as the Lord Chamberlain's Men. In 1599 they built their famous theatre, the Globe, on the south bank of the River Thames. Though known for his writing, Shakespeare also did some acting. By about 1611, he had largely retired from writing, but continued to act up until about the time he died. His cause of death is not recorded, and his will, signed about a month before he died, states that he was still in good health. He has so many famous plays, it's impossible to pick a single one which stands out above the rest. But among his most famous are: Hamlet, Romeo and Juliet, Othello and Much Ado about Nothing. He was also able to write across every genre popular at the time. From tragedy (King Lear) to comedy (A Midsummer Night's Dream) to historical (Richard III). His numerous sonnets also display his talent for writing poetry.